Green Noise will stop offering worm bins for sale at Eggplant Urban Farm Supply and other suppliers starting July 1, 2012. 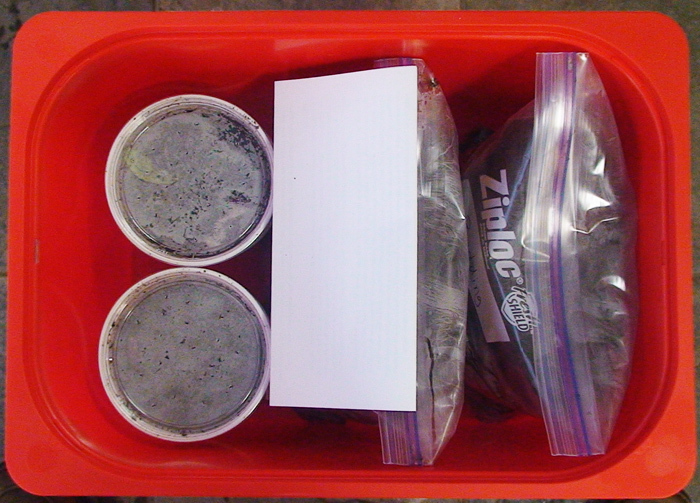 We will continue to offer worm bins for classes on worm composting at Eggplant and other locations upon request. What: The Super Basic Worm Bin is a plastic bin that holds up to approximately one cubic food waste and bedding material while it is being slowly digested (i.e., composted) by redworms and other living organisms that live within the bedding and inside their guts. Includes: Approximately 1 cubic foot polystyrene bin with a lid, 2-gallon bags of pre-moistened bedding material, 500 redworms, instructions, and other bedding amendments materials such as calcium carbonate, fine sand, and supplementary feeding materials. 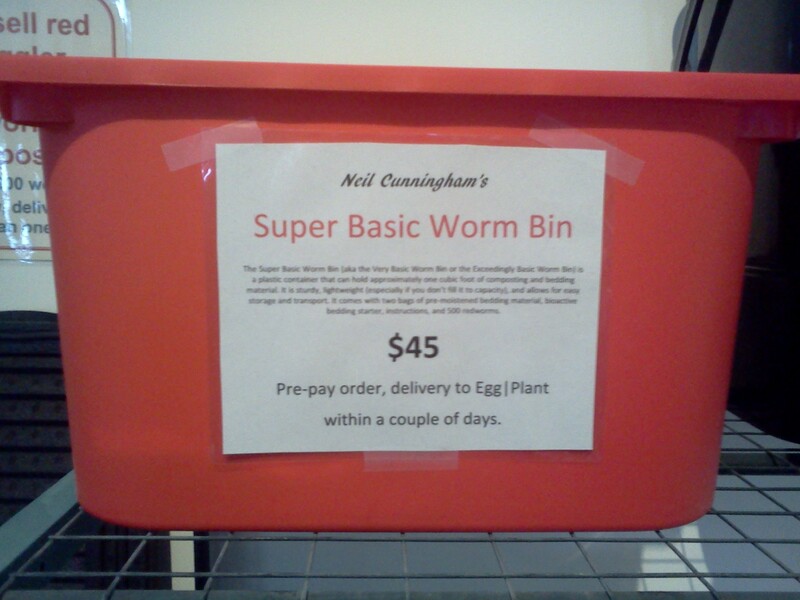 Cost: During workshops, this worm bin is offered for $45 (including registration); otherwise it is simply available for $45 at Egg| Plant Urban Farm Supply when you pre-order. Folks are encouraged to shop around for other bins or build their own; however, these tough little bins are proven effective for beginners who are just discovering the joy and science of worm composting or veterans who want to streamline their home system with minimal effort. About the size: While this bin may be considered “small” by some standards, it demonstrates that worm composting can happen successfully in bins of various sizes. One key advantage of a smaller bin is that it’s more manageable in terms of moving and handling; it doesn’t strain your back as much as a larger, heavier bin might if you want move your bins around, and we expect that you will want to move them around! Currently I manage between 50-60 of these bins, and a smaller bin is gentler on my back. Also, these bins are inexpensive, durable, and behave nicely when stacked. Dozens of Enchytraeid spp. worms can inhabit a clump of compost.